This Thomas Nast cartoon, like "How the Copperheads Obtain Their Votes," also appeared on November 2, a week before the presidential election on November 8. 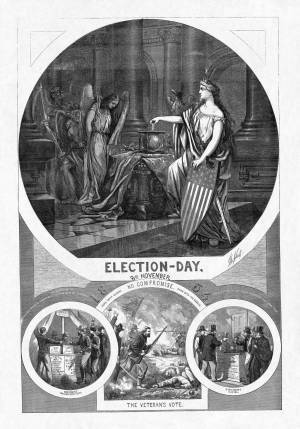 It shows Columbia (guarded by the American Eagle), soldiers, and respectable citizens, all voting for Lincoln’s reelection. In the upper-left, the angel of peace is held captive by the demons of "Southern Rebellion" and "Traitors North". The Democratic voter in the lower-right inset picture is a stereotypical caricature of a disheveled Irish-American, who is here being guided by a reporter from the pro-Confederate London Times. The lower-center panel reminds voters of the bloody sacrifice made by Union soldiers on their behalf.